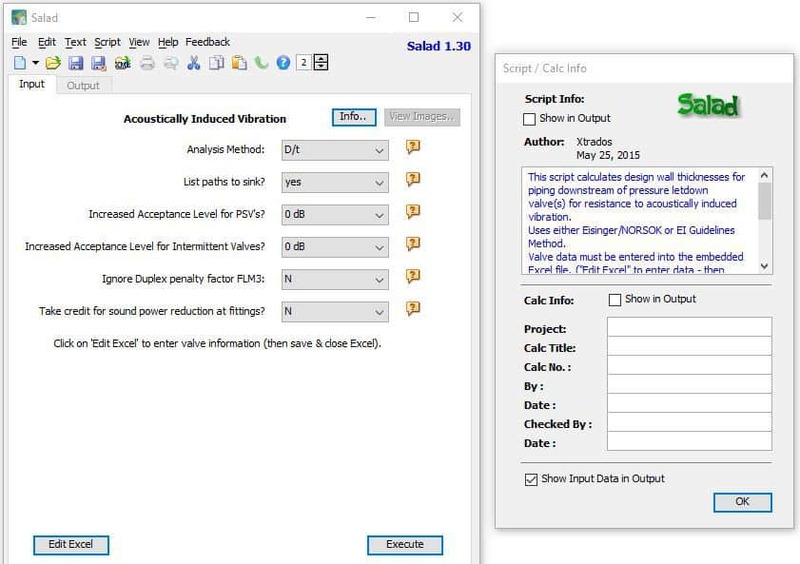 Salad works with pipe stress analysis data from CAESAR II by Intergraph, to help you prepare ancillary reports and calculations. It can even work as a ‘bridge’ to your existing or new spreadsheets. Salad can also be used for standalone calculations as an alternative to spreadsheet or math applications. Generate an Excel spreadsheet summarising your calculation on one sheet, including maximum stresses, displacements, weight sag, nozzle loads, springs, load cases and major input data. This is a great way to do a quick ‘sanity check’ on your model. Acoustically induced vibration check of your piping system, accounting for multiple sources and decay with distance. These calculations can be very time consuming to do manually, especially for multiple sources. API 610 check for all your load cases at once. Do a local stress check on all trunnions in your model in one go. If you have modelled the trunnions in your stress model, just tell Salad the restraint numbers and let it do the rest. Generate an API 617 compressor nozzle load summation for 10 load cases at a time. Generate a restraint summary in local co-ordinates. Great time saver for pipelines and skewed piping runs. Carry out a wall thickness calculation using the CAESAR II Material Database. You can customise any Salad script to your own needs (unlock using password ‘Xtrados’) and save it as a User Template. QA checks are complete for interaction with CAESAR II version 8. The software is now free to use and available to download below. * No Admin rights? You can use our Zip package, simply unzip it, store the unzipped folder anywhere you like and double click on Salad.exe to run. – Trunnion script now has the option to specify re-pads at desired locations (& optional thickness). See the script in-built help for details. We can help you to resolve issues and get the most out of the software. Please contact us if you’d like to discuss paid support or customisation. 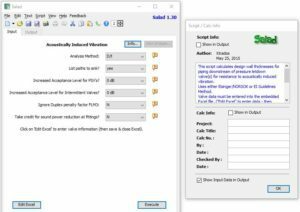 If you’d like to donate and keep development of this software going, why not consider instead purchasing our X313 Excel add-in for piping engineers? That way you’ll get something else useful back in return.